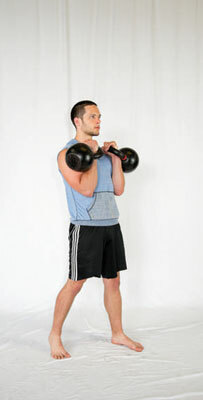 Clean two kettlebells up into the rack position. Be sure to keep everything as tight as you possibly can — bracing your abs, squeezing your glutes, and engaging your quads — and stand tall. Don’t lean back while you’re in the rack position because doing so will immediately compromise your back. 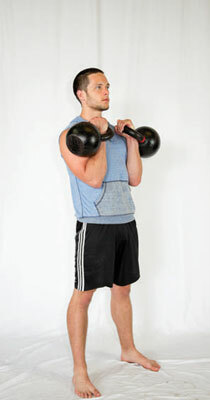 If at any time you catch yourself leaning back, set the weights down immediately. When you’ve gained a stable position, start to walk around in any direction you want. When performing rack holds and racked carries, breathe shallow and into your belly. When the weight gets heavy, you’ll find it nearly impossible to take a deep breath anyhow, so taking shallow breaths in this manner will help you keep your back safe and control the stress level.